A fuel cell electric powered bus is an effective and powerful hybrid configuration of batteries and hydrogen fuel cell. To give you expert insight into how this combination works in heavy duty vehicles, we sat down with Ballard Power Systems product manager, Alan Mace. 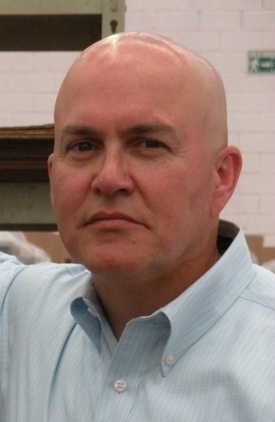 Mr. Mace has over 15 years’ experience in the fuel cell industry in engineering, service, and product management roles, and is responsible for product development activities for Ballard’s FCveloCity® power module. He holds a Bachelor of Science in Agricultural Engineering from Washington State University. Q: How does the fuel cell range extender work on an electric bus, and what are the benefits of a hybrid system vs a 100% battery or fuel cell system? We believe that for many bus routes, a combination of batteries with a fuel cell system is the ideal solution for zero emission transportation. This configuration performs as well or better than diesel and 100% battery buses. In this “hybrid” solution of batteries and fuel cell, the batteries help deliver peak power (for example, during bus acceleration). They also store the “free” energy available from deceleration through the regenerative brake system on the bus. The hydrogen-powered fuel cell is a lightweight on-board power generator operating at a (relative) constant output supplying 100% of the bus’ daily energy needs and extending electric bus range. The batteries remain at optimum charge throughout the day. This has cost savings implications by extending the life of the battery. Plus transit agencies avoid the costs of installing roadside charging infrastructure. Together, the hybridization of batteries and fuel cell really do provide an affordable, high performance solution. Q: Could you briefly describe the battery-fuel cell model that was developed as well as the key findings? We’re using a model which accounts for the required traction power, as well as auxiliary loads like heating, cooling, communications, and regenerated power from braking. One of the outputs of the model is the battery state of charge. We evaluate the state of charge for various operating conditions and ensure the fuel cell keeps the electric bus battery charged. We can also model buses of different configurations including frontal area, drag coefficients, and weight. These variables can then be applied to different types of routes. The route data includes second-by-second speed and acceleration, and we add topography to simulate transiting up and down hills. The model shows that, for many city routes, the average traction loads are relatively low, even less than 20kW. It also shows that the auxiliary loads are significant, sometimes even higher than the traction loads. This is especially important because many of the standard bus test protocols do not require accounting for auxiliary or passenger loads. Therefore, the stated range or acceleration capability of a 100% battery electric powered bus is misleading. For example, we know that the cabin heating load for a bus can essentially double the bus energy requirement which means that battery electric bus range could be only half of the reported range. But adding a fuel cell will extend the battery range by keeping it charged over the entire daily route. 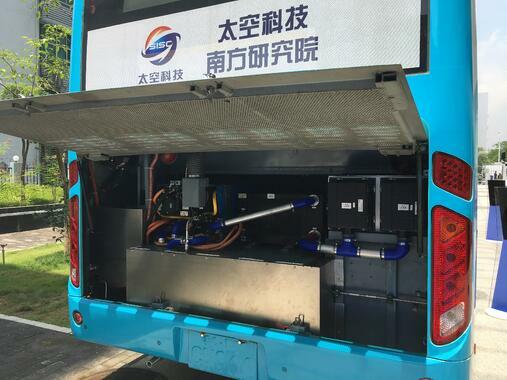 Another beneficial outcome of fuel cell electric powered bus model is that we’ve demonstrated that use of all the available fuel cell energy, including waste heat, has a really significant benefit to the transit agency by reducing their overall fuel consumption. Q: The model includes a hilly route and 20kW auxiliary load. What makes these conditions particularly challenging for 100% battery electric buses? Yes, providing heating or cooling of the passenger cabin requires approximately twice the power of just moving the bus. These “extra” loads can result in rapid consumption of battery energy and depletion of state of charge. To counteract this, battery buses can be fitted with extra batteries or diesel-powered heaters. However, the weight of the extra batteries must be accounted for by reducing the passenger-carrying capacity of the bus. Additionally, use of a diesel heater means that the bus is no longer zero emission. Traveling up hills is a rapid drain on the batteries due to the additional acceleration required to propel the bus up a hill, and the less than 100% efficiency of regenerative braking. For example, the model shows that a battery electric powered bus with 200kWh of battery operating on a route containing a hill and heating load will reach the battery minimum state of charge in less than six hours of operation versus the rated 14 hours. In contrast, a hybrid solution of fuel cell with 60kWh battery successfully completes the route while maintaining the battery state of charge over the entire day. While a battery electric bus is a good solution for some shorter and easier routes in mild climates, it’s evident why many transit agencies are planning for hybrid fuel cell-battery buses to replace their combustion engine-based fleets. Q: Beyond fuel cell bus applications, we’re hearing a lot about range extenders for commercial trucks. What makes this an attractive heavy duty application? Trucking includes a broad range of applications from lighter duty delivery trucks all the way up to class eight heavy duty long haul trucks. Some of these applications require sustained power levels that cannot be practically solved with a pure battery solution. Too much of the cargo capacity would be used for carrying all the batteries. However, many of these applications are well-suited to a fuel cell solution because of the favorable power density of a hybrid fuel cell-battery configuration. Tests and performance statistics prove it. When used together, fuel cell and battery technologies overcome the limitations of each technology on its own and deliver benefits of electric drive with the performance level of conventional buses. Therefore, a hybridized solution for heavy duty vehicles is the most effective way to meet zero-emissions goals in our communities. The benefits of such a solution are far-reaching, and include improved air quality, reduced traffic congestion, and improved mobility for our citizens. So what are we waiting for? Embracing fuel cell electric powered bus technology now will help us all breathe easier, and live better. Learn more about the benefits of hybridization for heavy duty vehicles in our free white paper below. Join the conversation. Let us know your thoughts in the comments. Discover the advantages of hybridization for the fuel cell drivetrain in this free white paper.